Islamic style: The architecture of the peoples of Islamic faith, also called Mohammedan, which from the 7th century onward expanded throughout the Mediterranean world and as far as India and China, producing a variety of great regional works and local decorative styles. Mudéjar: A fusion of Christian (Romanesque, Gothic, Renaissance) and Islamic art created in the 12th to 16th centuries by the Muslims who remained in Christian territory after the gradual Christian reconquest of the Iberian Peninsula (Spain and Portugal). Used to identify Muslims living openly as Muslims under Christian rule from the 11th to the 17th centuries, until final expulsion by 1614. In 710, Muslims conquered Visigoth Spain. Starting in 1021, the Christian Spaniards began to reconquer Muslim areas - the Reconquista, or Reconquest - not completed until 1492. By the 13th century, the only remaining Muslim stronghold was the Nasrid dynasty in the Kingdom of Granada. From the Arabic mudajjan, "those staying behind." 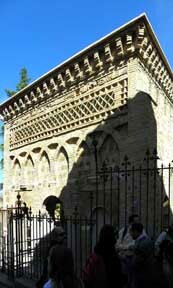 The term Mudejar style was first coined in 1859 by José Amador de los Ríos. The Mudejars were responsible for the construction of many of new building projects embarked on in the recently conquered cities, among which were the churches erected in the name of the new faith. In this way the term Mudejar came to represent an architectural style in its own right. Mudejar... any of the Muslims who remained in Spain after the Reconquista, or Christian reconquest, of the Iberian Peninsula (11th–15th century). In return for the payment of a poll tax, the Mudejars - most of whom converted to Islam after the Arab invasion of Spain in the 8th century - were a protected minority, allowed to retain their own religion, language, and customs. With leaders assigned by the local Christian princes, they formed separate communities and quarters in larger towns, where they were subject to their own Muslim laws. The Mudéjar style... is characterized by the use of brick as the main material. Mudéjar did not involve the creation of new shapes or structures (unlike Gothic or Romanesque), but the reinterpretation of Western cultural styles through Islamic influences. The dominant geometrical character, distinctly Islamic, emerged conspicuously in the accessory crafts using less expensive materials: elaborate tilework, brickwork, wood carving, plaster carving, and ornamental metals. To enliven the planar surfaces of wall and floor, Mudéjar style developed complicated tiling patterns that have never been surpassed in sophistication. Even after Muslims were no longer employed in architecture, many of the elements they had introduced continued to be incorporated into Spanish architecture, thereby giving it a distinctive appearance. The Alcázar of Seville is considered one of the greatest surviving examples of the style. The Alcázar expresses Gothic and Renaissance styles, as well as Mudéjar. The Palace originally began as a Moorish fort. Pedro of Castile continued the Islamic architectural style when he had the palace expanded. Portugal also has examples of Mudéjar art and architecture, although the examples are fewer and the style more simple in decoration than in neighbouring Spain. Mudéjar art should be seen as the survival of Islamic art in Christian society, although this interpretation is only valid from a formal point of view as the Islamic decorative and structural forms in Mudéjar art express the thoughts and values of Christian and not Islamic culture. Elements of Islamic art combined perfectly with the Western artistic tradition to create a new form which differed depending on whether the combination was based on Romanesque, Gothic or Renaissance art. As a result, strictly speaking, Mudéjar art did not belong to either the Islamic or Christian artistic traditions. A link between two cultures, Mudéjar art became the artistic expression of a complex society in which Jews, Christians and Muslims lived side by side. This makes it a unique phenomenon in the history of art.